, the founder of the sect of Arians, in the fourth century, was a presbyter, probably a native of Alexandria, and officiated in a church in that city, although it is not certainly known in what capacity. It was, here, however, that he first declared those doctrines which afterwards rendered his name so celebrated, and which have descended to our own times. In an assembly of the presbyters of Alexandria, the bishop of that city, Alexander, in a speech on the subject of the Trinity, maintained, among other points, that the Son was not only of the same eminence and dignity, but also of the same essence with the father. This assertion was opposed by Arius, on account, as he pretended, of its affinity with the Sabellian errors, which had been condemned by the church, and he took this opportunity to assert that the Son was totally and essentially distinct from the Father; that he was the first and noblest of those beings whom God the Father had created out of nothing, the instrument by whose subordinate operation the Almighty Father formed the universe, and therefore inferior to the Father both in nature and dignity. What his opinion was concerning the Holy Ghost, or the other doctrines connected with the orthodox belief, is not known. Alexander, however, in two councils assembled at Alexandria, accused him of impiety, and caused him to be expelled from the communion of the church. This was in the year 319, or 320. The sentence appears to have extended to expulsion from the city, upon which he retired to Palestine, and wrote several letters to | the most eminent men of the times, in favour of his doctrine, and exhibiting himself as a martyr for truth. Constantine, the emperor, at first looked upon this controversy as of trivial import, and addressed a letter to the contending parties, in which he advised them not to injure the church by their particular opinions, but, finding this of no avail, and observing the increase of the followers of Arius, in the year 325, he assembled the famous council of Nice in Bithynia, in which the deputies of the church universal were summoned to put an end to this controversy. Here, after much debate, the doctrine of Arius was condemned, and himself banished among the Illyrians. He and his adherents received also the opprobrious name of Porphyrians, his books were ordered to be burnt, and whoever concealed any of them were to be put to death. This severity, however, rather repressed than abolished the tenets, or lessened the zeal of Arius and his friends, who regained their consequence by a trick which marks the unsettled state of public opinion, and the wavering character of the emperor Constantine. 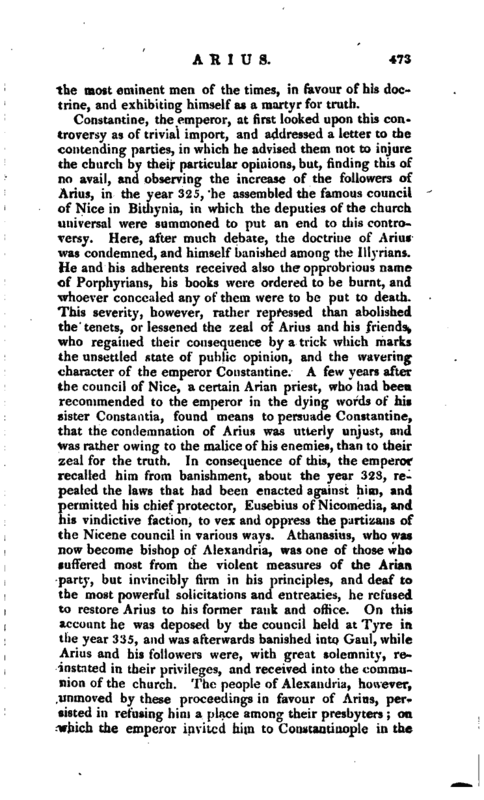 A few years after the council of Nice, a certain Arian priest, who had been recommended to the emperor in the dying words of his sister Constantia, found means to persuade Constantine, that the condemnation of Arius was utterly unjust, and was rather owing to the malice of his enemies, than to their zeal for the truth. In consequence of this, the emperor recalled him from banishment, about the year 328, repealed the laws that had been enacted against him, and permitted his chief protector, Eusebius of Nicomedia, and his vindictive faction, to vex and oppress the partisans of the Nicene council in various ways. Athanasius, who was now become bishop of Alexandria, was one of those who suffered most from the violent measures of the Arian party, but invincibly firm in his principles, and deaf to the most powerful solicitations and entreaties, he refused to restore Arius to his former rank and office. On this account he was deposed by the council held at Tyre in the year 335, and was afterwards banished into Gaul, while Arius and his followers were, with great solemnity, reinstated in their privileges, and received into the communion of the church. 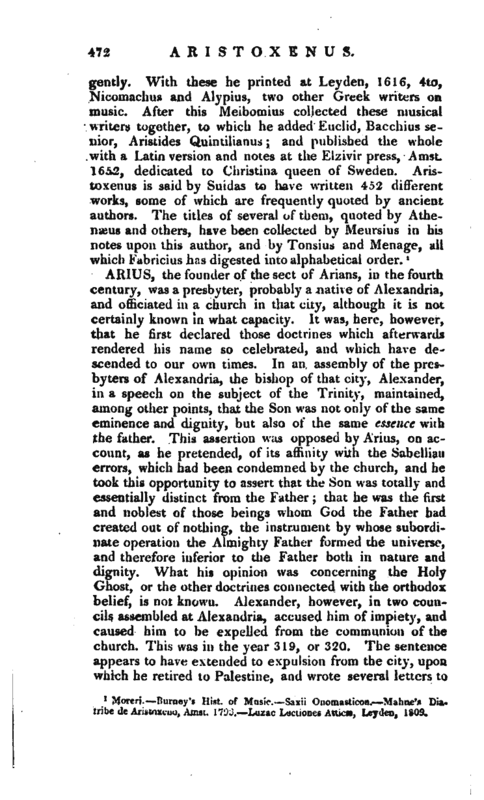 The people of Alexandria, however, unmoved by these proceedings in favour of Arius, persisted in refusing him a place among their presbyters; on which the emperor invited him to Constantinople in the | year 336, and ordered Alexander, the bishop of that city, to admit him to his communion; but before this order could be carried into execution, Arius died suddenly as he was easing nature. As this event happened on the day appointed for his admission, his friends gave out that he was poisoned; and his enemies, that he died by the just, judgment of God. On the latter report, we need make no remark, but the accounts of his death by no means favour the belief that he was poisoned. 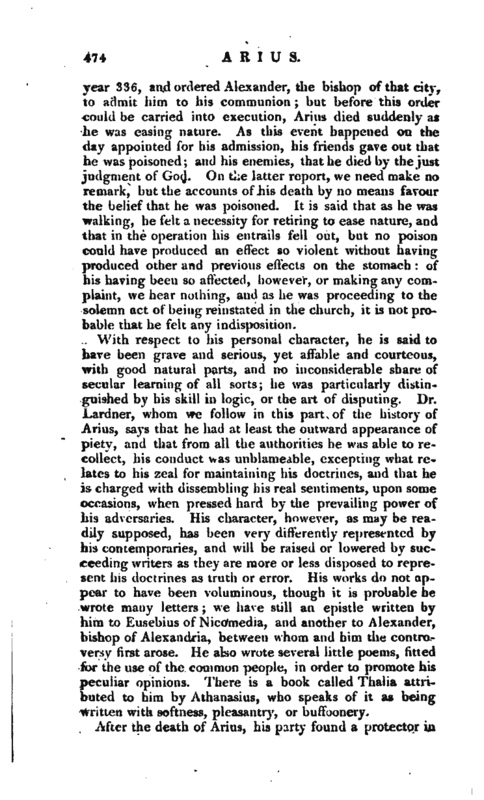 It is said that as he was Walking, he felt a necessity for retiring to ease nature, and that in the operation his entrails fell out, but no poison could have produced an effect so violent without having produced other and previous effects on the stomach: of his having been so affected, however, or making any complaint, we hear nothing, and as he was proceeding to the solemn act of being reinstated in the church, it is not probable that he felt any indisposition. With respect to his personal character, he is said to have been grave and serious, yet affable and courteous, with good natural parts, and no inconsiderable share of secular learning of all sorts; he was particularly distinguished by his skill in logic, or the art of disputing. Dr. Lardner, whom we follow in this part of the history of Arius, says that he had at least the outward appearance of piety, and that from all the authorities he was able to recollect, his conduct was unblameable, excepting what relates to his zeal for maintaining his doctrines, and that he is charged with dissembling his real sentiments, upon some occasions, when pressed hard by the prevailing power of his adversaries. His character, however, as may be readily supposed, has been very differently represented by his contemporaries, and will be raised or lowered by succeeding writers as they are more or less disposed to represent his doctrines as truth or error. His works do not appear to have been voluminous, though it is probable he wrote many letters; we have still an epistle written by him to Eusebius of Nicomedia, and another to Alexander, bishop of Alexandria, between whom and him the controversy first arose. 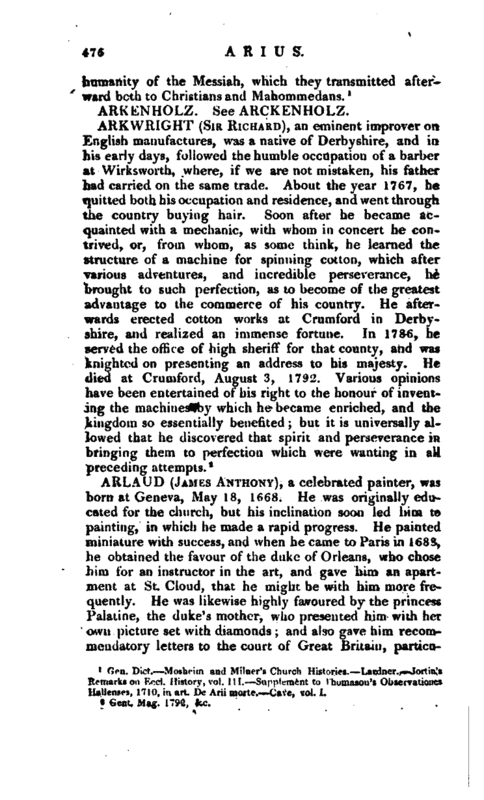 He also wrote several little poems, fitted for the use of the common people, in order to promote his peculiar opinions. There is a book called Thalia attributed to him by Athanasius, who speaks of it as being written with softness, pleasantry, or buffoonery. After the death of Arius, his party found a protector in | Constantius, who succeeded his father in the empire of the east. They underwent various revolutions and persecutions under succeeding emperors; till, at length, Theojdosius the Great exerted every effort to suppress them. Their doctrine was carried, in the fifth century, into Africa, under the Vandals; and into Asia, under the Goths: Italy, France, and Spain were deeply infected with it; and towards the commencement of the sixth century, it was triumphant in many parts of Asia, Africa, and Europe: but it sunk, almost at once, when the Vandals were driven out of Africa, and the Goths out of Italy, by the arms of Justinian. It revived again in Italy, under the protection of the Lombards, in the seventh century, and was not extinguished till about the end of the eighth. Arianism was again revived in the west, by Servetus, in 1531, for which he suffered death. After which the doctrine became established in some degree in Geneva and Poland, but at length degenerated into Socinianism. Erasmus, it is thought, aimed at reviving it, in his commentaries on the New Testament; and Grotius seems to incline the same way. Mr. Whiston was one of the first divines who revived this controversy in the eighteenth century, and he was followed by Dr. Clarke, who was opposed by Dr. Waterland, his principal adversary, and by Gastrell, Wells, Nelson, Mayo, Knight, and others. 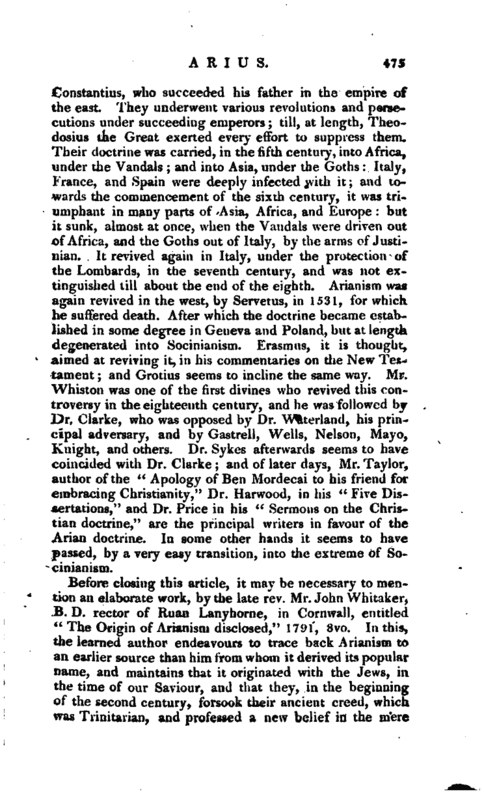 Dr. Sykes afterwards seems to have coincided with Dr. Clarke; and of later days, Mr. Taylor, author of the “Apology of Ben Mordecai to his friend for embracing Christianity,” Dr. Harwood, in his “Five Dissertations,” and Dr. Price in his “Sermons on the Christian doctrine,” are the principal writers in favour of the Arian doctrine. In some other hands it seems to have passed, by a very easy transition, into the extreme of Socinianism. Gen. Dict. Mosheim and Milner’s Church Histories. Lardner. Jortiu’s Remarks on Eccl. History, vol. III. Supplement to Thomason’s Observationes Hallenses, 1710, in art. De Arii raorte. Cave, vol. I.